How to Know When God is Giving You a Sign? ​This morning I was scheduled to get a Hep A vaccination. The vaccine was in preparation for future travel plans to Africa. The appointment was at 9 am, but something happened that kept me from getting the vaccine. At 6:30 am I started running a fever and shaking uncontrollably as a result. For a whole hour I didn’t know what was wrong with me. It was during this time that I prayed to God, and I understood clearly that He was giving me a sign. Everyone knows that you should not get a vaccine if you are running a fever. No doubt, God was telling me that I shouldn’t go to Africa. As if this were not enough, my plans to travel to Africa had already been cancelled twice within a year’s time period due to varying circumstances. This was God’s sign that I should focus my evangelistic efforts on the mainland of the U.S.
​While the bare facts of this story are true, the assumptions drawn from the events are purely speculative. Was God really sending me a sign? How do I know if God wants me to go to Africa or not? There are many sincere souls in the evangelical world very quick to assign such events to the working of God’s hand in their lives. Nonetheless, the answer for interpreting signs and knowing God’s determined purpose for your life is found in God’s written word. Just before delivering the freshly penned Book of the Law to the Levites in Deuteronomy 31:9, Moses said, “The secret things belong to the Lord our God, but those things which are revealed belong to us and to our children forever, that we may do all the words of this law,” (Deut. 29:29). God’s determined purpose for the lives of His people has been a faithful process throughout time: God speaks to His prophet through a dream, vision, or face to face (i.e. Moses), the prophet speaks to the people, and finally, the words of the prophet are recorded in writing so that future generations can know God’s will. This was the process in Deuteronomy and remains faithful through the book of Revelation. ​The written word of God is the Christian guide for life and decision making. Does God want me to go to Africa? The answer lies in, “What does God’s written word say on the matter?” Does God want me to move to Texas? The answer lies in, “What does God’s written word say on the matter?” Does God desire that I marry this woman? Again, “What does God’s written word say on the matter?” If there were a modern day prophet like Samuel to reveal God’s will that the eighth and unlikeliest son of Jesse would be the leader of God’s people (1 Samuel 16), then things would be different. As it is, Samuel, Nathan, Elijah, Hosea, John, and Paul are all dead. What is not dead is the living word of God in written form (Hebrews 4:12). These few quotes from Psalm 119 are only a sample tasting of what the song says about God’s word. The last two verses in particular indicate the answer to knowing God’s will for your life: read the written word and meditate on it. ​The view that God’s written word is the only lamp for the Christian’s feet today is quite unpopular. Why? Perhaps it is because such a view of God’s word is too taxing. Such a view requires meditating on the written word constantly, even in the night watches. Surely God rather intends His people to get a quicky inspirational Bible verse from their phone app and proceed to interpret travel plans to Africa based on intuition. Or maybe God simply permits things to happen on a daily basis, some good, some bad, and these daily occurrences are not to be interpreted as signs from God. Maybe when God gave the Great Commission of Matthew 28:18-20, this was His sign to everyone from 30 A.D. to 2018 to spread the gospel all over the earth, including Africa. Perhaps God’s written word is what I should put my trust in (Psalm 119:42) and make daily decisions with it as the foundation. Start hiding the written word of God in your heart today. Allow God’s living words to direct your path. Have I Examined Myself Today? ​My brothers eye might have a spec, and I might be the right person to talk to him. But, before I go so far as to help my brother, I am to consider my own spiritual life first (Mt. 7.1-5). Human beings are professional critics of others, we analyze, criticize, and ostracize. While there is a place for “righteous judgment” (Jn. 7.24), critical examination should began in the mirror. This is why our Lord in His wisdom has commanded us to self-examine, to test ourselves, and determine whether we are in fact walking in The Faith (2 Cor. 13.5; Gal. 6.4). In fact, part of the Communion which we partake in on the first day of every week is to be set aside for self-examination (1Cor. 11.28). 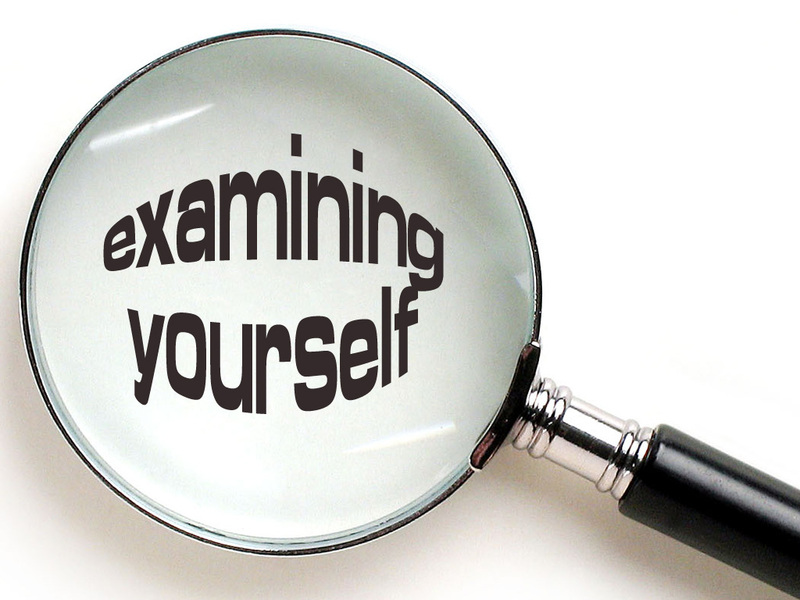 So, have I examined myself today? ​To accomplish this God pleasing task of self-examination one must have three things. First, an honest heart, self-examination demands the ability to honestly evaluate and acknowledge what is found. In the case of many, what is found is sin. With the ugly revelation one must then choose not to ignore this sin, but God calls everyone to repent (Acts 17.30). Secondly, an objective standard, something to measure ones conduct by. This is not a standard set by sinful man but by God himself, Who’s words purpose is for teaching, reproof, for correction and for instruction in righteousness (2Tim. 3.16-17). Divine approval comes only from looking at oneself, rightly dividing God’s word and conforming to God’s inspired word, in doing so we present ourselves approved to God (2Tim. 2.15). Thirdly, one must have a purpose. To self-examine without a purpose is futile. It is the Christians responsibility to refrain from being “fashioned according to the world” and instead to be “transformed by the renewing of your mind” (Rom. 12:1-2). When we look into the mirror of self-reflection our one purpose must be to mold our life to the mind of Christ (Phil. 2.5; 1Cor. 11.1). ​Finally, in order to accomplish these things, in 2 Corinthians 13.5 Paul tells every Christian to “Examine yourselves as to whether you are in the faith”. This phrase is delivered in the present tense, suggesting sustained examination. When Jesus told the parable of the pharisee and the tax collector who went to the temple to pray (Luke 18) He spoke of one who boasted in himself that he was greater than other men. In contrast, a tax collector stood “afar off”, not even willing to lift his eyes to heaven praying for mercy upon himself, “a sinner”, this man went home justified. Notice Christ teaches it was the one who was “courages enough to examine himself and take careful notes” that pleased his Creator. Therefore we as Christians, as Paul and Christ taught, are to have sustained examination, that is honest, objective and purposeful, as to not fall into an illusion of false security.